The Russian manufacturer of tanks and railway cars offers joint development of freight wagons and establishment of assembly lines using the latest technology. The Uralvagonzavod Research and Production Corporation (UVZ), a Russian machine building company located in Nizhny Tagil, is looking to work with the Indian Ministry of Railways to help modernize India’s large railway network. 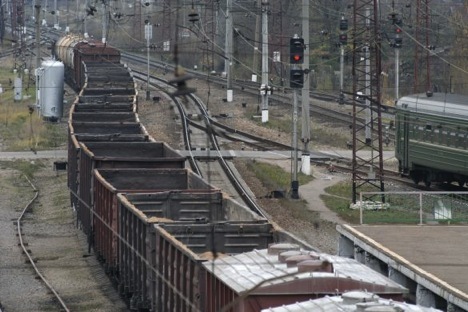 UVZ would like to help the Indian Railways in the area of production capacity expansion and upgrades, Uralvagonzavod Chief Executive Oleg Sienko said during the St Petersburg International Economic Forum (SPIEF). “We are ready to offer cooperation on joint development and production of freight train wagons, organisation of unit and component manufacturing and establishment of assembly lines using the latest technologies available to us,” Sienko said. India’s railway network, one of the largest in the world, was built by the British colonisers in the 19th century and is in urgent need of modernisation. The government of India has constituted an expert group under the chairmanship of Sam Pitroda to recommend ways and means to modernise Indian Railways to meet the challenges of economic growth, the aspirations of the country’s growing population and the needs of changing technology. UVZ hopes to play an important role in the process. The UVZ plant, which is well known in India for being the largest main battle tank manufacturer in the world, would like to work with the country in civil projects as well. The company has made a substantial contribution to strengthening the partnership between Russia and India, Sienko said. UVZ took part in the fourth India-Russia Business Dialogue that held within the framework of the SPIEF on June 21. Another project, where the Russian manufacturer could cooperate with the Indian Railways is the Delhi Mumbai Industrial Corridor, where new cities will be built between India’s national and financial capitals. At the business dialogue, stress was placed on Russian companies availing of the vast opportunities available in infrastructure as well as in other identified areas. The UVZ plant was built during 1931-1936 and initially manufactured freight cars. The company's main products include railway cars, tanks, road-building vehicles, agricultural vehicles, metallurgical products, tools and consumer goods.